Each servomotor rotates around 180 degrees. 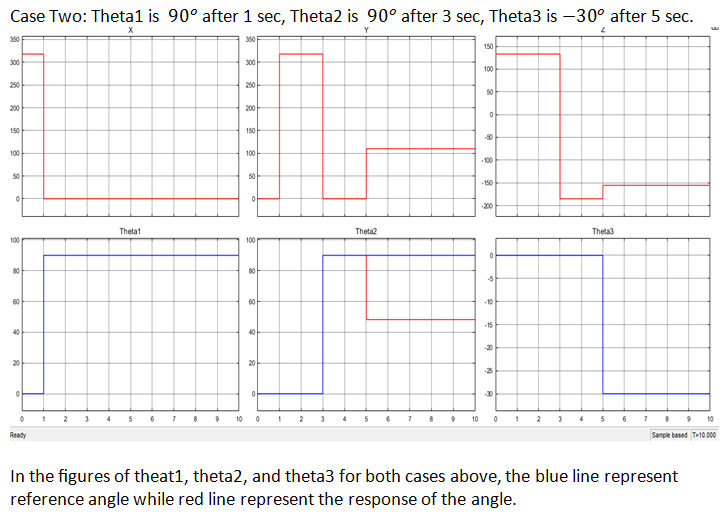 The angles of the theta2 and theta3 represent 90 degrees in the figure above. 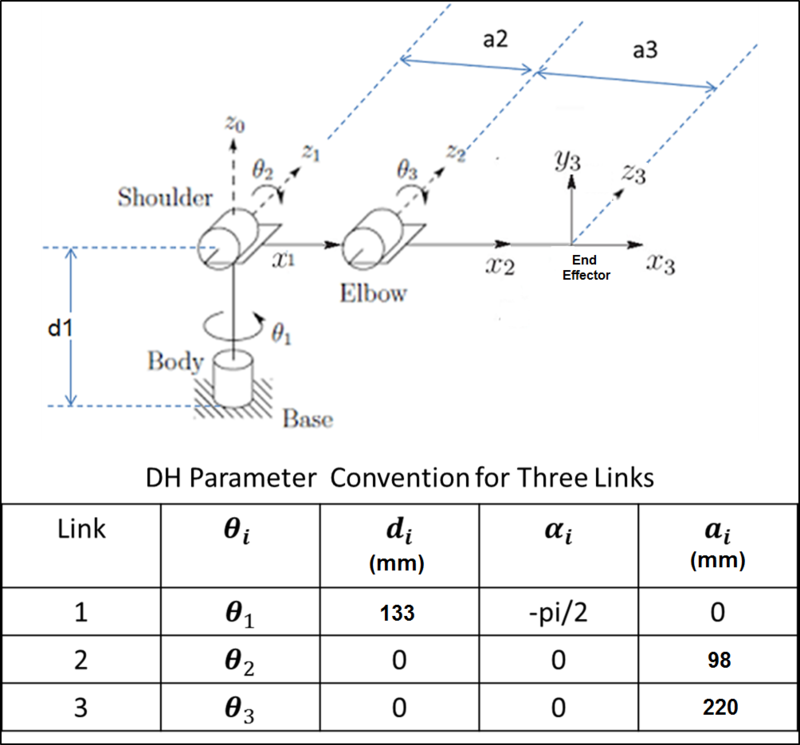 I found the forward kinematics by using the parameters of DH convention, as shown in the figure above. The position of the robotic arm end-effector is correct for any angle of theta1, theta2, and theta3 between -90 and 90 degrees. 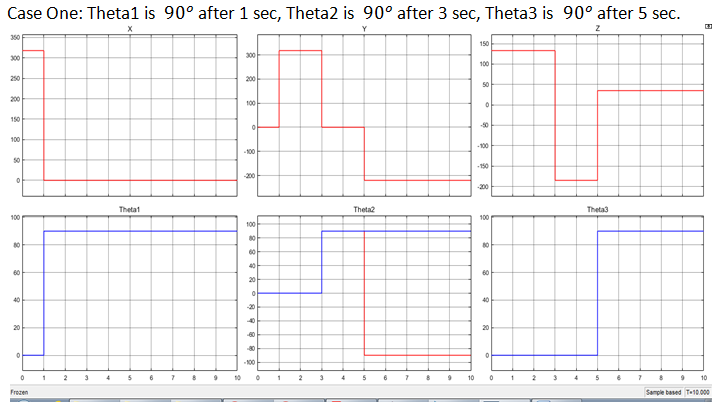 My problem is in the inverse kinematics of the robotic arm, where, the theta2 always affected by theta3 and thus the response of theta2 incorrect, while theta1 and theta3 are always correct. Please see the cases below that show this problem. I’ll get you started, and see if you can calculate all three joint angles given values for $X$, $Y$, and $Z$. If you cannot, we can continue peeling the onion until you are able to do that. You will have to manipulate the expressions for $X$, $Y$, and $Z$, and use trigonometric identities to solve for the individual joint values. Start with the easiest: using the $X$ and $Y$ terms only, you should be able to write an expression that only involves th1. It will be a tangent function that can be inverted to find th1. Next, square the $X$ and $Y$ terms, and add them together. This will eliminate th1 from the expression. Subtract $Z$ squared from the remaining terms. You should be left with expressions of a constant times [cos(th2 + th3) cos(th2) + sin(th2 + th3) sin(th2)]. Using a trigonometric identity, this can be solved for th3 using the inverse cos function. See if you can get to this point, then try other manipulations to solve for (th2 + th3), which will get you the last value. I think the debate is a bit off topic. To me, the question is about why is the inverse kinematics wrong when applied to a forward kinematics solution computed for joint angles $\ge$ 90 deg. and the answers match what's in the graphs provided. So far, so good. where mask indicates that we only care about solving for the first 3 elements of the Cartesian pose (x,y,z). Note: the translation part is correct, the rotation part is different but we don't have enough DoF to independently control that. which is the set of joint angles we started with, so this is another valid solution, the blue line in the graph. is far from the initial pose shown above. 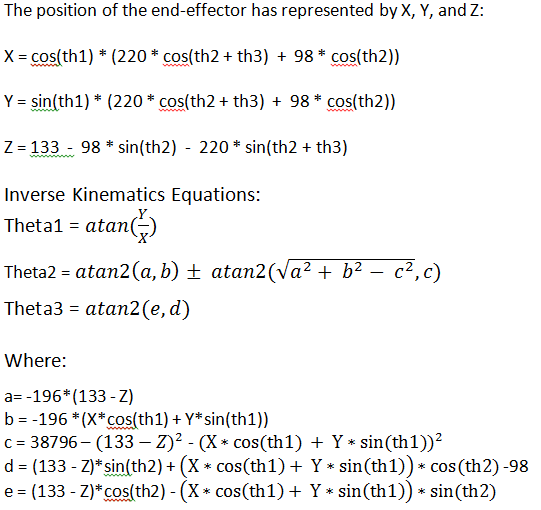 Conclusion the IK equations implemented are not correct. There should be at least 4 solutions: 2 for q1 (you have only 1), and 2 for q2 (which you have). Maybe another set of 4 where $\theta_2$ and $\theta_3$ are offset by 180deg. we can see the two solutions. Calculating the forward kinematics with a mathematical equation is straight forward and recommended for all robotics arms. Trying to do the same with inverse kinematics results often in troubles. The problem is, that a given goal coordinate in the 3d space can be reached with different poses and during it's nonlinear nature it's not easy to find an explicit formula. The problem is, that a forward model can't be transformed into an inverse model by simply modifying the equation into a new one. Instead an approximate IK-solver is needed here. For realizing such a solver the forward model gets random values as input and the best node of the resulting graph is identified with the help of constraints. The principle is called monte carlo IK solver or sampling based ik solver and is a standard widget in animation programs like Blender. Perhaps a short note at the end: even the problem looks easy to solve on the first look, inverse kinematics is one of the hardest problems in robotics control. Running into trouble is the normal case and Google Scholar provides many thousands of papers about the pros and cons of different solvlng techniques. For some researchers the problem is so hard, that they give up the idea of a kinematic chain at all and use a more simpler mechanic design which is a linear robot. Such a design can reach a point in the space with lower amount of calculations.